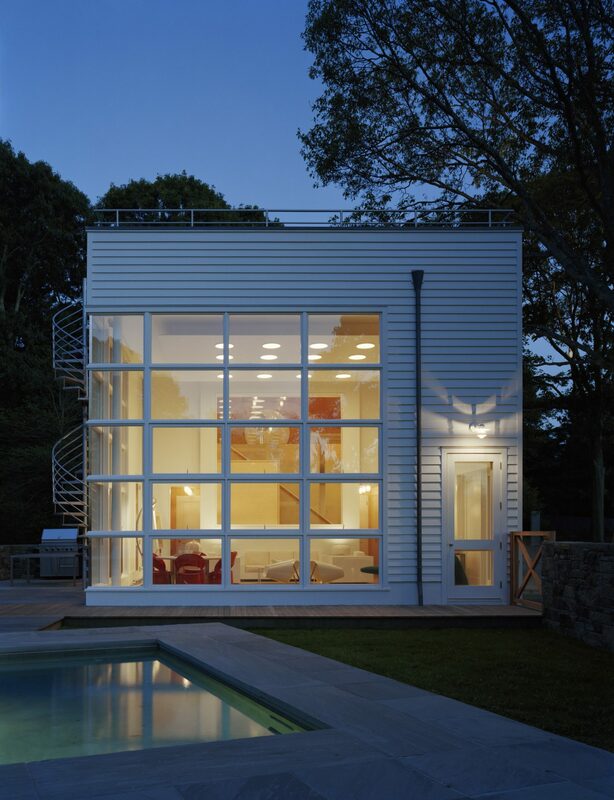 Brief: In this garage and mechanical building, create a pool house/interior residence consisting of bedroom, kitchen, bath and outdoor space while integrating the adjacent swimming pool, sculpture garden and views of the creek. Solution: Because the building is located so closely to the street, it has an exterior vernacular similar to those of the adjacent buildings. The massing is stepped up the further the building proceeds into the property. 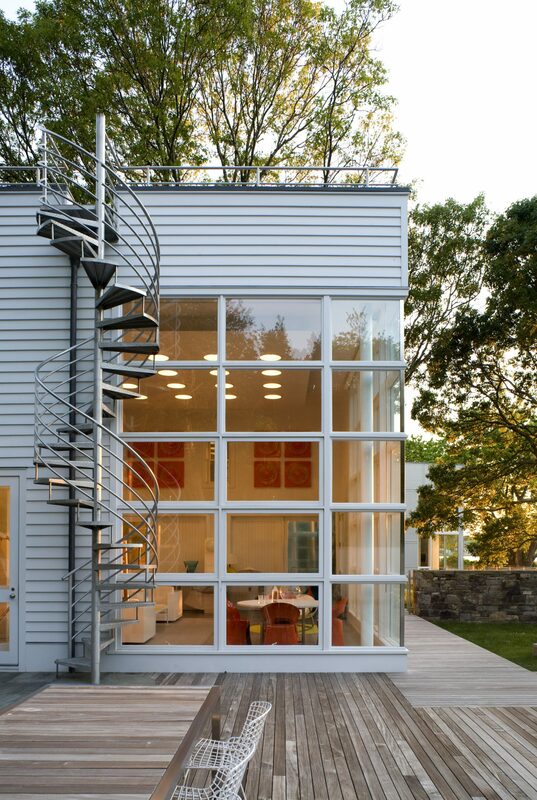 As a result, the interior can become more open to the views and garden, as an opaque seemingly traditional building type turns the corner into a modernist two-story light-filled cube. 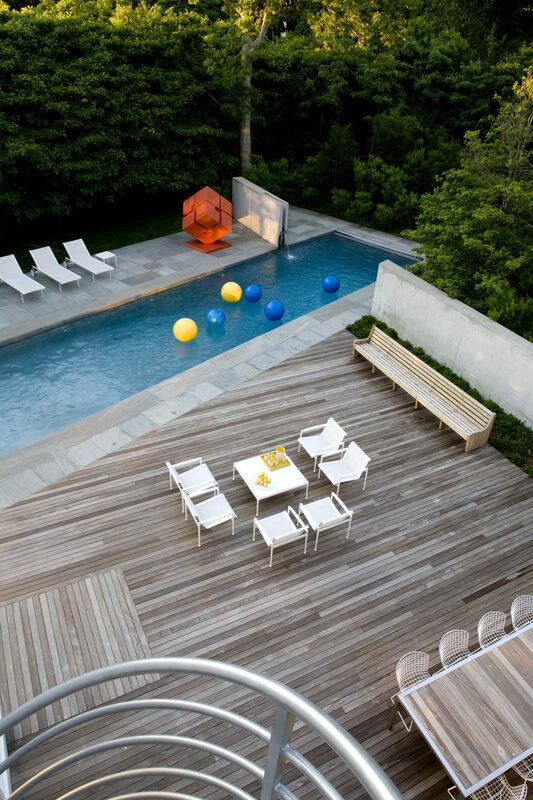 A double-height space is integrated with the pool, sculpture garden and water view. Furnishings, both inside and outside, are comprised of Bauhaus building blocks that blur the lines between exterior and interior, sculpture and furniture. 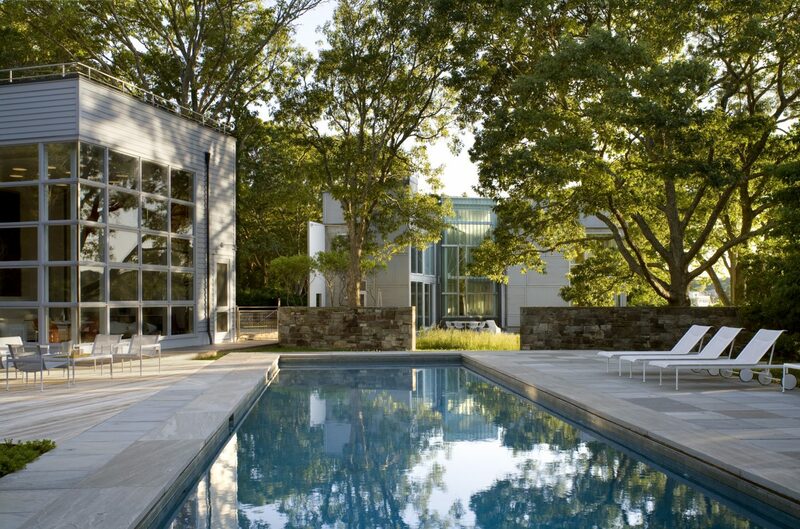 The concrete floor is similar in palette to the stone and wood surfacing used as the exterior paving. 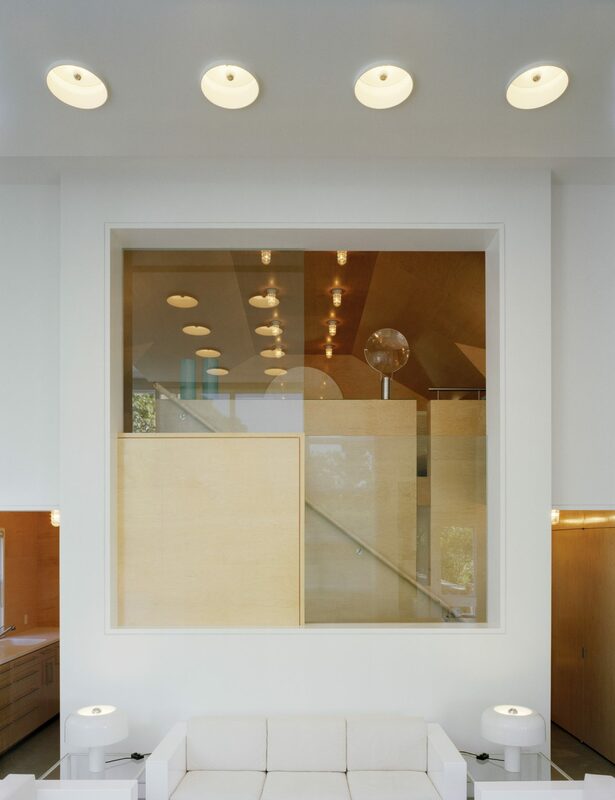 A concrete colored rug and a floating ceiling of levitating portholes define the main seating area in the two-story living space. 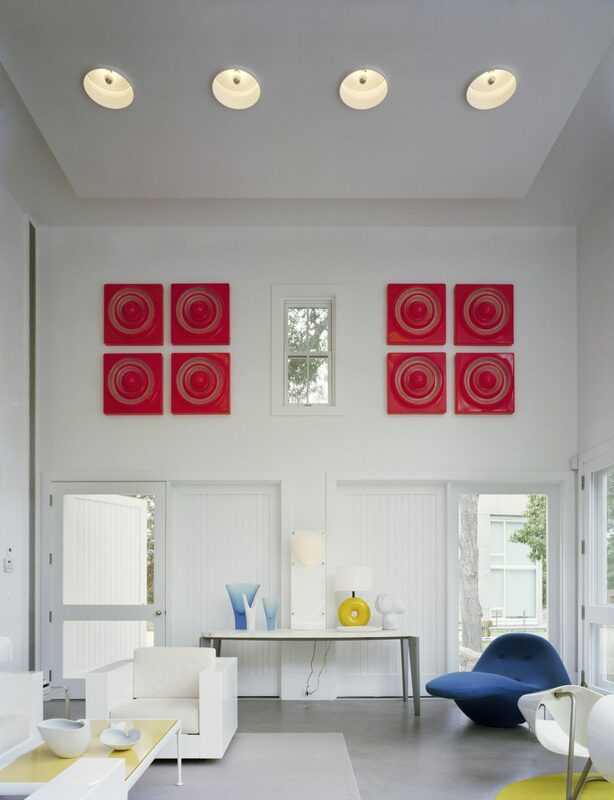 Its shapes are echoed in the orange plastic wall lights by Vernor Panton. 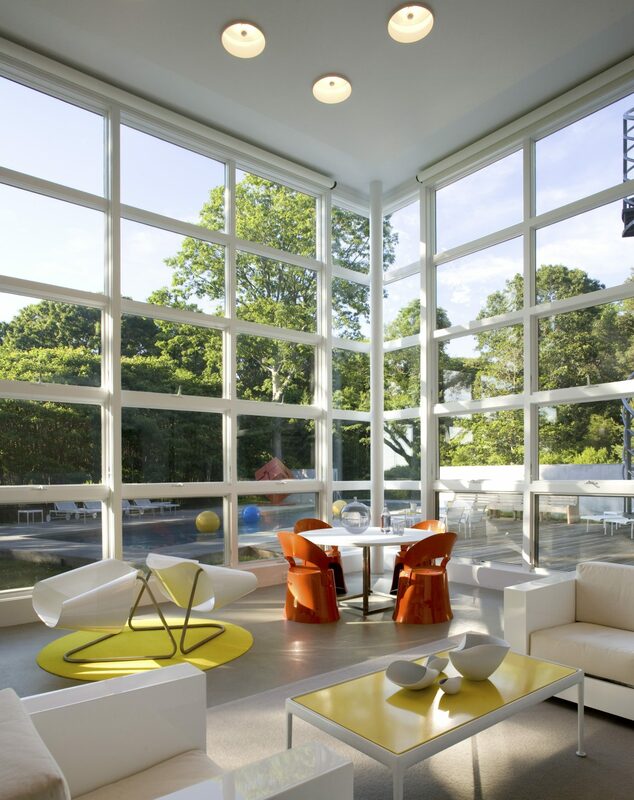 Those round shapes are echoed in a set of 8 orange Vernor Panton wall light sculptures as well as the yellow rug that anchors two Italian chairs set back to back. 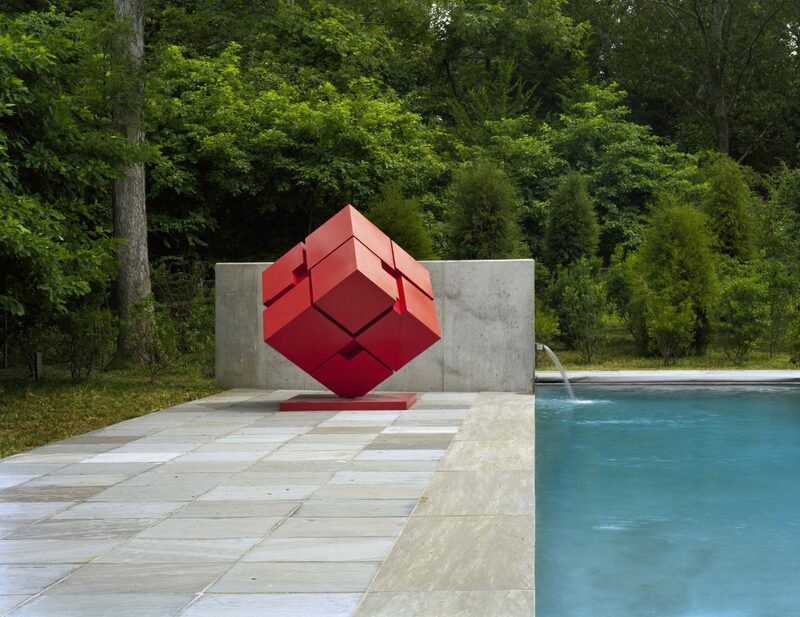 Both interior and exterior furnishings become abstract shapes in a sculpture garden. 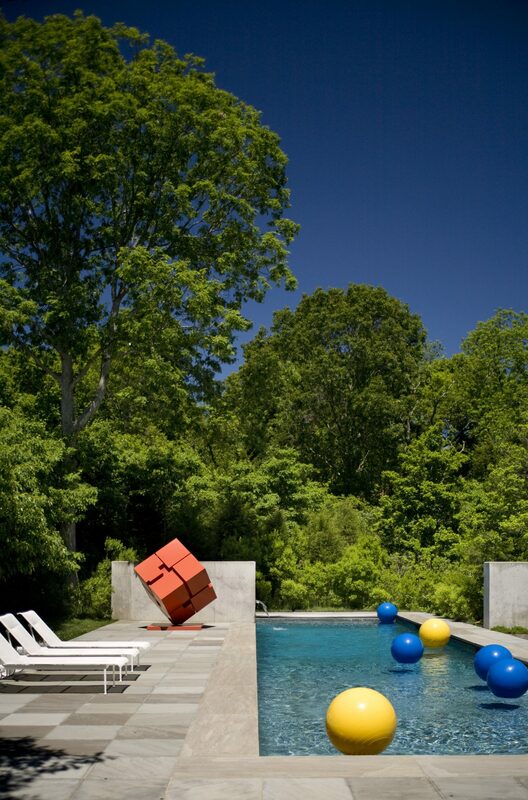 Some of the same furniture is used inside and outside, an orange spinning sculptural cube generates the color of the seating that surrounds the round Poul Kjaerholm dining table. The yellow rug that hovers on the floor is like a child’s balloon and anchors the two Italian chairs that are placed back to back. 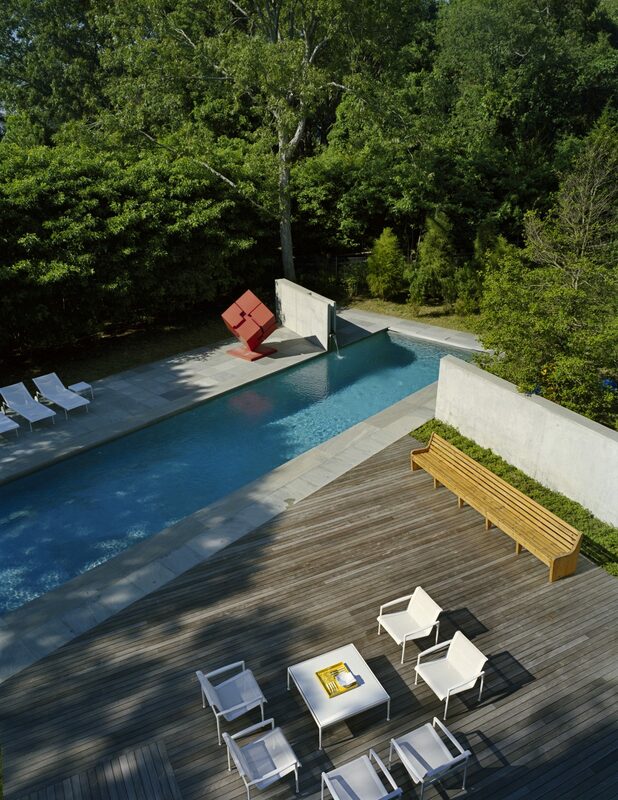 Isamu Nogucihi’s Wind Chimes galvanized tin sculpture and the marine blue porpoise-shaped cantilevered Colani chaise are the interior sculptures. A two-story proscenium masks the stepped down massing of the gables beyond and is a cubist composition of layers of light, wooden planes and glass. 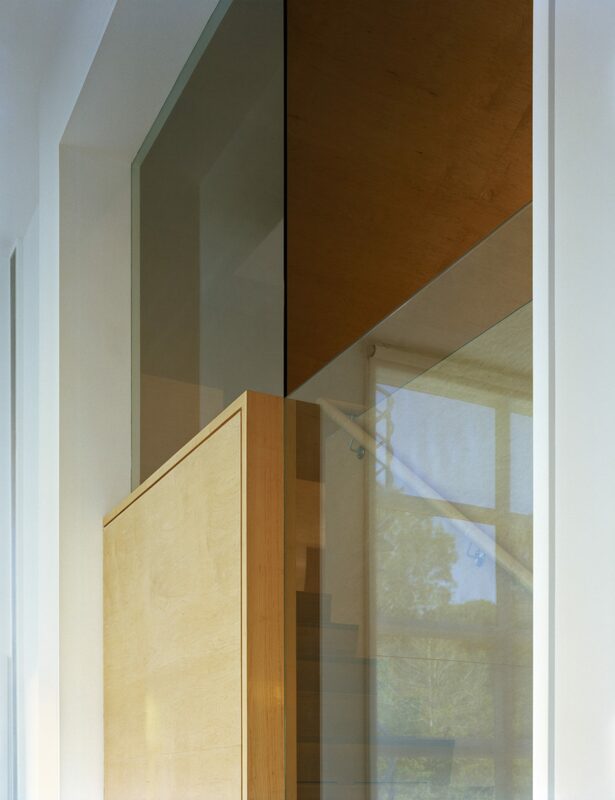 The bedroom, bathroom, stair and all storage are constructed of maple with all furnishings wood, wicker and linen. 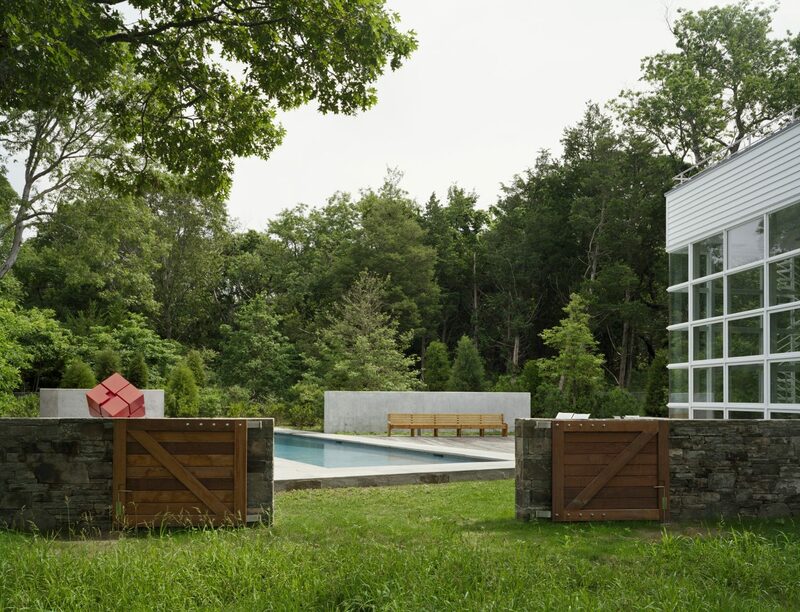 The upstairs bedroom becomes a maple tree house that faces the view of the sculpture garden, swimming pool, outdoor room and creek. 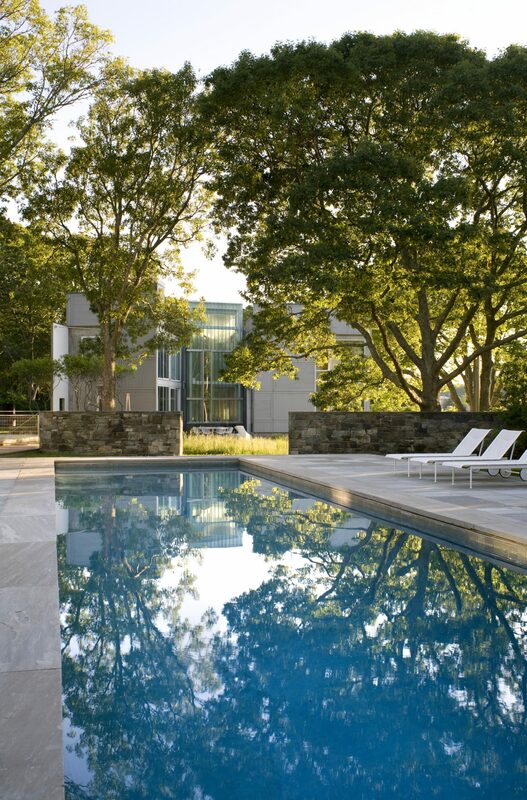 This interior blurs the boundaries of inside and outside. 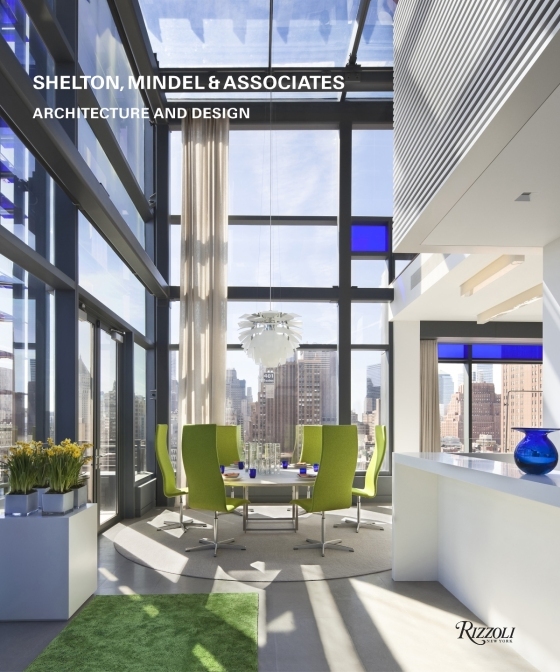 Architecture, lighting and furnishings are seamlessly integrated with the building and its context.